In 2017, two major stories in Local SEO are Mike Blumenthal’s research into Fake Review networks and Spammy Business Names. While Google is apparently working on these issues, changes are too slow to arrive. It still pays to cheat on Google and that’s not a good thing for anyone. The competitive mental health industry is flooded with spammy business names and while some folks for sure just don’t know the rules, many are knowingly breaking them. I’ve taken the time to manually update over 100 Google listings for therapists with bogus business names. It’s kinda fun and anyone can do it! But what if you were a serious service provider for therapists and your offering knowingly included spammy SEO tactics? Is this okay? Having keywords and city names in Google Business Names does affect rankings and gives these listings a boost over their competition. Theravive knows this. One thing we know for sure is that these business names are BOGUS. So what can we do about this? Can someone report this to Google? Would anyone at Google do anything about this? It’s doubtful. One thing you can do is seek these listings out in your city and click on “suggest an edit” and manually edit the listing. These edits may not be permanent, but it’s at least something. 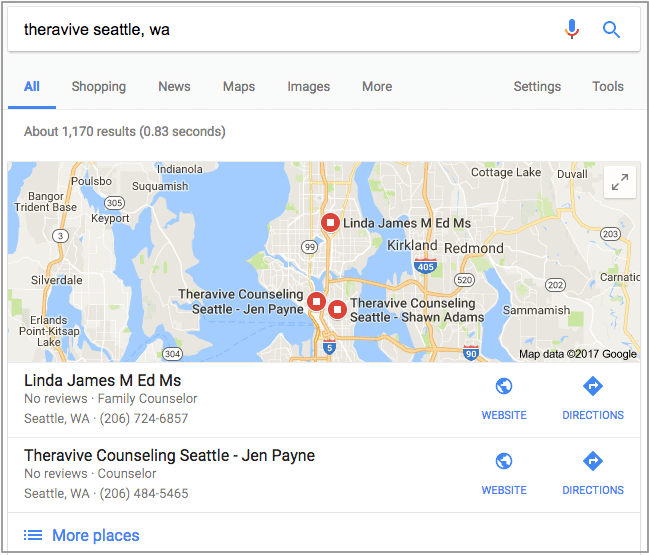 If you are a therapist – or any other business owner for that matter – and your competitors are getting away with spammy business names you can report them to Google My Business via Twitter or on Google Maps. Hopefully Google addresses this situation soon. If you have stories of successes or failures please let us know in the comments. Success with Edits to Spammy Theravive Google listings!